Medical College of Georgia Dean Peter Buckley looked out through a glass wall of the J. Harold Harrison MD Education Commons Building and saw the steeple of Paine College’s chapel rising up above buildings on the fringe of Georgia Regents University campus and pronounced himself impressed. “That’s beautiful,” he said, as he toured the building a day before its grand opening today. Many of those buildings will disappear and be replaced with new student housing and the parking lot in front of the new building will be replaced with green space and become a true student “quad,” said Dr. Paul Wallach, vice dean for academic affairs at MCG. 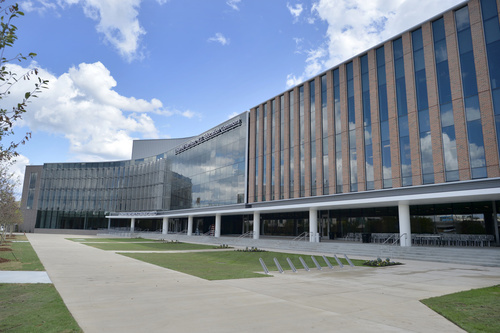 With the College of Dental Medicine building next door and the new classrooms and simulation center that will allow all of the health professional students to train together, “this is going to redefine the university,” Buckley said. No place will exemplify that more than the new Education Commons Building, which has been carefully designed to reflect a new way of teaching and learning, Buckley and Wallach said. For instance, every place in the two 300-seat classrooms for the first- and second-year classes has power ports for connecting and also a microphone. Rather than the “sage on the stage” style of lecturing with its one-way communication, “we want engaged learning in this classroom,” Wallach said. It will also accommodate an expansion from 190 medical students in Augusta and 40 in Athens to possible 240 and 60 sometime in the future after the school gets an accreditation visit in 2016. Every feature of the new building seems aimed at modernizing education. All of the free areas on the first floor feature seating in different combinations to allow students to study by themselves or in groups and accommodate all different approaches to learning, he said. In others, such as McKnight Family Hall, the tables and chairs can be moved and arranged in any combination to accommodate a lecture, small group learning or any combination, Wallach said. The ceiling features four projectors, pointed at screens on each wall, that allow students to see no matter which way they might be facing, he said. The 190 students per class is one of the largest medical class sizes in the country so the school is dividing students into academic houses that will include incoming as well as more advanced students and two faculty advisors. “The faculty and more senior students can do peer advising” of the younger students, Wallach said. That will be enhanced by 13 “learning community spaces,” which look like nice lounges with couches, chairs and a kitchen area, to which houses will be assigned. “This is our hope through that these types of spaces and this type of program we can enhance the mentorship and the relationships as people go through their medical education,” Wallach said. The most eye-catching part of the new Education Commons is the 40,000-square-foot Clinical Skills Center, which features many state-of-the-art simulators where budding doctors, nurses, technicians and therapists can run scenarios that can be recorded and broken down in a briefing room immediately across the hall. Wallach, who has designed these centers at other medical schools, calls this “one of the nicest in the country.” Walking down the hallway is like being in a hospital ward with all manner of patients and scenarios in each one. And the center was designed with them in mind, Wallach said. The center also has 30 exam rooms where students will interact with standardized patients, people taught to mimic a disease, where the encounters can also be observed and recorded and the students assessed for teamwork and interpersonal skills like making eye contact with patients. And that will start with even the newest students, he said.